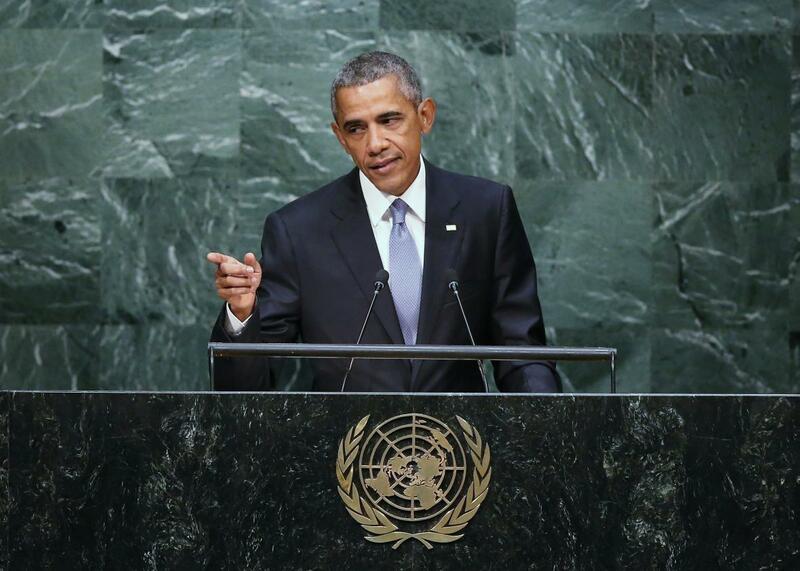 Obama General Assembly speech: President says Assad must go, rejects Russia worldview in U.N. address. U.S. President Barack Obama addresses the U.N. General Assembly on Sept. 28, 2015, in New York City. Speaking to the United Nations General Assembly on Monday morning, President Obama rejected the idea of Bashar al-Assad remaining in power as part of a negotiated settlement in Syria. His remarks appeared to be aimed directly at Russian President Vladimir Putin. The president blamed Assad’s violent response to peaceful protests in 2011 for creating the chaos that allowed groups like ISIS to grow. He continued: “Realism dictates that compromise will be required … realism also requires a managed transition away from Assad and to a new leader.” Obama has gotten into trouble by drawing “red lines” in the Syrian conflict before, and Monday’s speech left him a little bit of wiggle room. Secretary of State John Kerry has said recently that while the U.S. position is that Assad must step down, the timing of his departure is negotiable. Obama’s statement also shouldn’t be taken as an indication that the U.S. will use military force to push Assad out—something it’s scrupulously avoided throughout the conflict. Even beyond the portion on Syria, much of Obama’s speech seemed crafted as a prebuttal to Putin. “There is not a conspiracy of U.S.-controlled NGOs that expose corruption and bring down leaders,” Obama said, contradicting Putin’s contention that U.S. support led to the overthrow of the pro-Russian government in Ukraine and other former Soviet countries. “A government that suppresses peaceful dissent is not showing strength, it is showing weakness and it is showing fear,” he continued. While Syria and Russia took up much of the speech, Obama earned his biggest applause by discussing the normalization of relations with Cuba and stating “I’m confident that our Congress will eventually lift an embargo that should not be in place anymore.” Realistically, though, he might have a better shot with Putin than Congress.